The historic town of Sant Andreu de Palomar was annexed by Barcelona in 1897, apparently to the protests of its citizens of the time. Now part of the municipal district which bears its name, the area still retains a fiercely independent Catalan identity, even providing the setting for the local Catalan language television stations popular soap-opera. Situated between Nou Barris, Sant Mart and Horta-Guinard and bounded to the north by the river Bess, it is the third largest of Barcelonas ten municipal districts, combining industrial, commercial and residential areas. 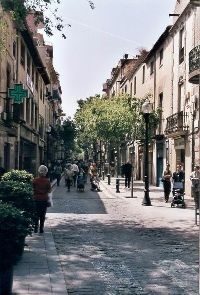 The seven barrios that together make up the Sant Andreu district each have their own history, making for a pleasant mixture of distinctive building styles; from early 19th century palazzos to avant-garde workers housing from the 1920s and 30s, to the inevitable apartment blocks from the 50s and 60s. The Fabra y Coats textile industry has been in Sant Andreu for over 100 years and still employs around 200 people one of its former factories, known as El Vapor del Rec, is now the Can Fabra Cultural Centre, one of several cultural centres and libraries dotted around the neighbourhood. Other amenities in this well-established district include half-a-dozen theatres and a number of small parks with sporting facilities, like the Parc de la Pegaso, where you can play ball games from ping-pong to petanca. Two underground lines serve the area along with several bus routes and there are two main line train stations at Estacis Sant Andreu Comtal and Arenal.